Stephanie's decorating style is, let's say kind of minimalist. Her house has dark hardwood floors, buck white walls, lots of marble and some dramatic chandeliers. We promise one day to show more of it, but its new and still a work in progress. 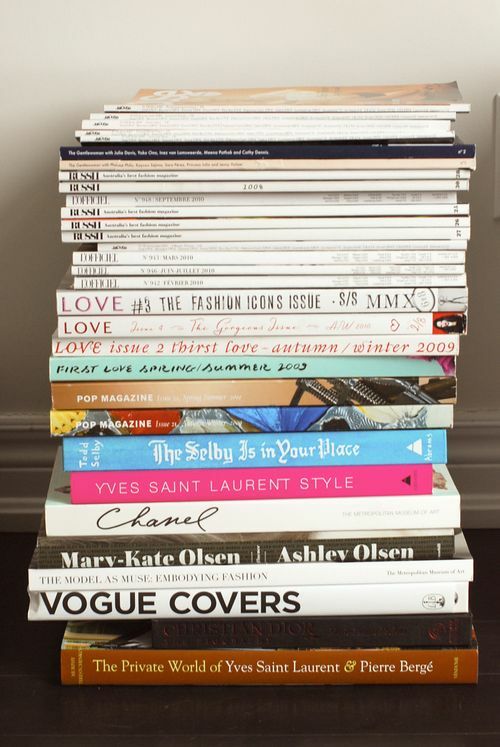 As streamlined as her decor is, everyone has some sort of collection, and for her its books and magazines. Remember this photo of Julia Restoin Roitfeld on the Selby? We just had to use it as our inspiration (okay we're obsessed). But see these magazines here? This is just a fraction of Stephanie's collection. When she and Adam moved from their downtown loft to the townhome they had built Adam had no idea just how many magazines were stored away at her parents. Boxes, and boxes and boxes. Nylon circa 2002, check. Interview circa 2003, check. 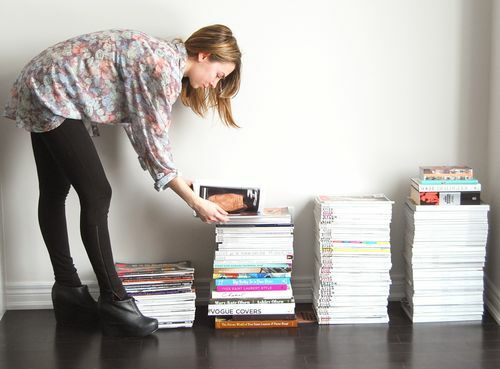 Stephanie fondly remembers her first subscription to Teen People (thanks Mom), and though the titles she loves now have evolved from Nylon (in her teens) to Jalouse and L'Officiel (in her twenties), her collection tells a story. She can't wait to turn one of the rooms upstairs into a library to house them all. Stephanie is wearing a floral chiffon blouse courtesy of American Apparel, and Jeffrey Campbell wedges. Stephanie's favourite publications are Jalouse, L'Officiel, Vogue Paris, Purple, Lonny, Rue, Frankie, Love, Russh, Pop, Interview, Lula and Vogue Living.